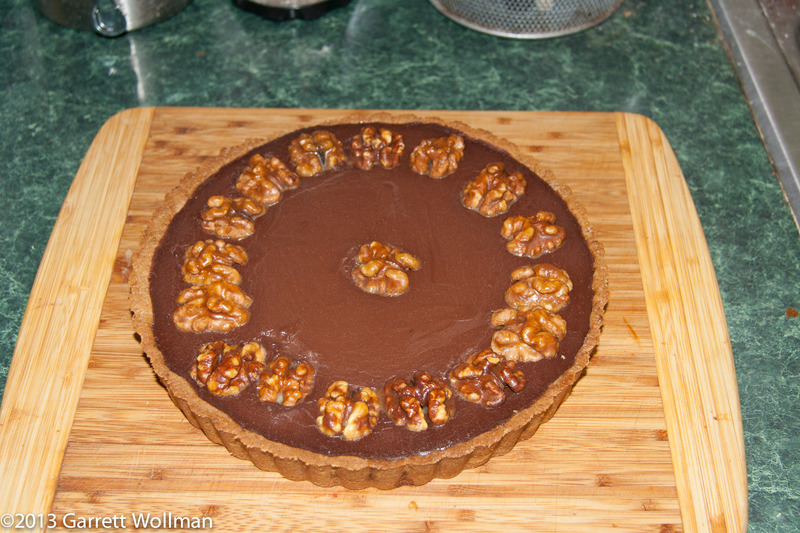 One of my favorite holiday-time desserts is a chocolate-caramel-walnut tart from Cook’s Illustrated . I first made it in 2007 after picking up the recipe in CI ‘s holiday baking annual; searching today, I found the original recipe was from the November, 2004, issue. The tart is made in a nine-inch fluted tart pan, and has a modified pate sucree crust (made with ground, toasted walnuts and confectioner’s sugar). On top of that sits the dark caramel layer, with more walnuts (roughly chopped this time), and an even darker chocolate custard layer. On top, caramel-coated walnuts provide additional decoration as well as a slicing guide. The first time I made this recipe, I used black walnuts rather than the usual English walnuts. Black walnuts have a much stronger flavor than the regular kind, and not everyone liked the result, so lesson learned: don’t substitute walnuts. The recipe probably could be made with other nuts in place of the walnuts (which would please my officemate, who has a walnut allergy but can eat pecans) but in doing it this year I chose to stick with the recipe. As much as possible, I stuck to the ingredient weights given in the recipe rather than the volumetric measurements, and I noticed that for some of the ingredients, including the walnuts, there was a significant difference. (In every case, the difference meant a larger quantity for scale-measured ingredients than the volume given as equivalent.) The whole process takes about five hours including prep work, although there are some pauses early in the process as the tart crust needs to be chilled three times. OK, time for the pictures. First up is the whole tart, in the pan, after cooling in the refrigerator for about 14 hours. The tart is baked in a nine-inch fluted tart pan, then cooled for several hours in the refrigerator. The crust was blind-baked under pie weights for half an hour, then cooled on a rack and filled with caramel and chilled before adding the custard topping and baking a second time. You can see that I’m not very good at making a circle of evenly spaced caramel-coated walnuts. I blame the caramel coating, as they were quite sticky. 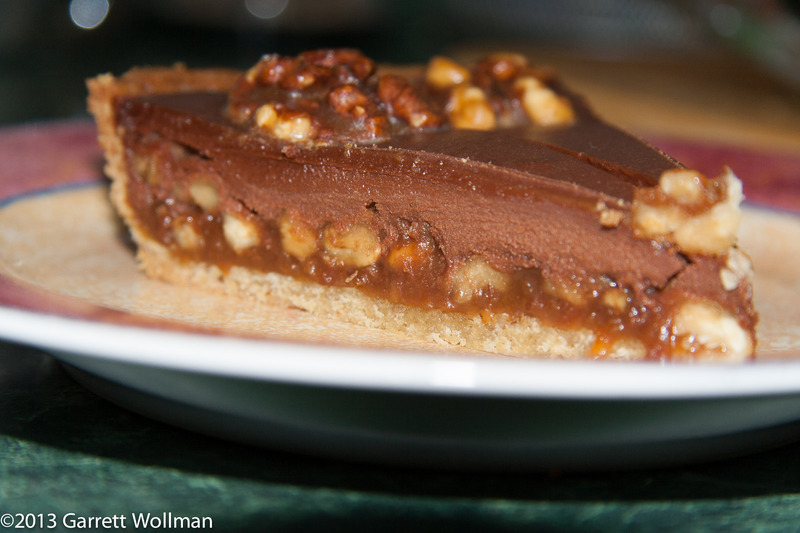 The vertical cross-section shows the three layers of this tart: pastry crust on the bottom, a layer of caramel and chopped walnuts above that, and on top, a rich chocolate custard. I used Valrhona Manjari feves to make the chocolate custard. I would probably serve this with a dollop of whipped cream (although there’s plenty of cream already in the filling). I put the whole recipe through a nutrition calculator and came up with the following pseudo-“Nutrition Facts” label. Note that this assumes that the whole tart crust recipe is used (there was quite a bit left over) and that the tart is sliced in twelfths, so the nutrition values are probably a bit overstated (particularly if you have better slicing skills than I do and can make 16 portions). 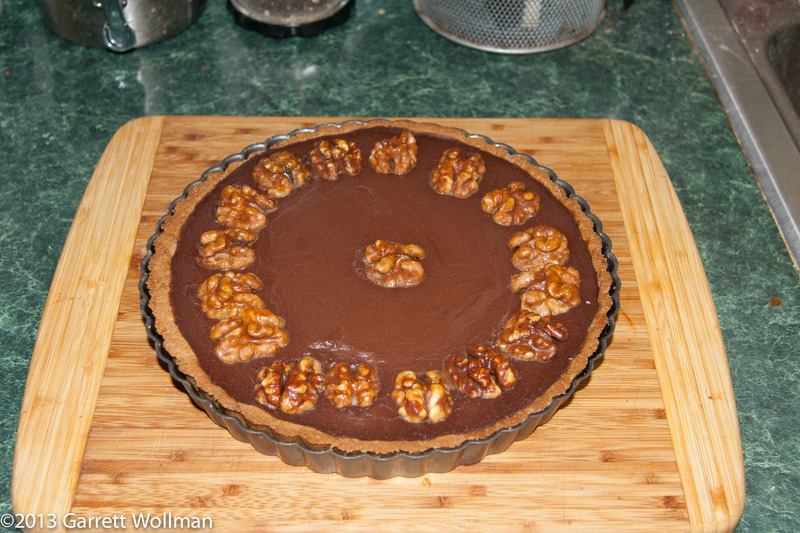 This entry was posted in Food and tagged baking, chocolate pie, nuts, recipe. Bookmark the permalink.